Gender stereotyping is one of the most talked about topics in gender politics today, as attitudes surrounding gender roles in the West begin to change. Take the gendering of children’s toys, for instance. Walk down the aisles of popular toy stores around the world and the obvious colour-coded identifiers are unmistakable. Playhouses and dolls are packaged in highlighter pinks and vibrant purples. Trucks and action figures are packaged in deep blues and earthy greys. Thanks to the new wave of brand marketing in the 60’s and the launch of kids cable television channels in the 80s, children’s toys have been divided by gender more now, than 50 years ago. However, as conversations around gender-related issues become common among younger generations, parents and the LGBTQ+ community, we’re now seeing increased efforts by brands and institutions to shift the paradigm of gender stereotyping and gender identity to favour more gender-neutral terminology. Last year, we discussed how brands can use language sensitivities to navigate gender identities in order to reach younger consumers. Adapting language that caters to gender neutrality is fast becoming a common practice used by brands in the retail and FMCG sectors to differentiate themselves, target new audiences and fine-tune the marketing of products that aren’t necessarily gender-specific. Recently, John Lewis became the first UK retailer to remove gender labels from its children’s clothing after brands such as Morrisons faced backlash from parents over selling children’s clothes with gendered slogans that were deemed to be sexist. Morrisons sold boy’s t-shirts with the slogan “Little man, big ideas”, while the female equivalent stated “Little girl, big smiles”. John Lewis has even gone a step further and removed gendered children’s sections from their stores completely. While some retailers insist they’re simply providing a product that their customers want, the impact of brand perception on social media platforms, coupled with the change in attitudes towards gender stereotypes, indicates that this may not necessarily be the popular opinion. But this isn’t the first time a major brand has removed gender labels from its products. It’s a trend that’s borne from the fashion industry due to its close proximity to pop culture. Celebrities including Jaden Smith, often wear clothes labelled ‘for women’ and was recently featured in a Louis Vuitton womenswear campaign. Similarly, fashion designer John Galliano has been known to cast androgynous men in his Margiela womenswear shows. 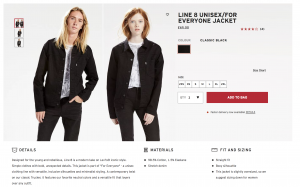 It’s no surprise that high street brands are starting to follow suit with the likes of Zara launching gender-neutral collections, while Arcadia recently announced that Topshop and Topman customers are free to use any of the fitting rooms located within its stores. Online retailers are in a prime position to make these changes more quickly than legacy bricks-and-mortar brands like John Lewis. For example, brands that sell children’s toys on Amazon are already adapting their product names and descriptions to omit the words ‘boy’s’ and ‘girl’s’ and replace with the inclusive term ‘kids’. 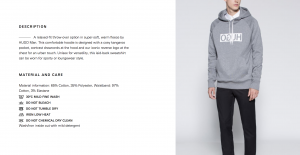 Fashion brands that produce unisex clothing lines often omit typical gender-based phrases in product descriptions. For example, ‘beautifully shaped’ has traditionally been used to describe the feminine silhouette of a product targeted at women. Instead, brands like Hugo Boss tend to highlight the simplicity of the product, keeping its copy focused on its basic functionality. Interestingly, Levis Strauss & Co takes a more intuitive and inclusive approach that’s more in line with the brand. Its unisex line of clothing, aptly named ‘Unisex/For Everyone’, includes the phrases ‘inclusive silhouettes’ and ‘versatile fit’ and its eCommerce product page features both male and female models. Grammatical gender is born out of historical evolution as opposed to our primary experience of the world. Considering the world’s linguistic diversity, grammatical gender isn’t perceived in the same way from country to country. Both Hungarian and Finnish completely lack grammatical gender, while English holds gender pronouns for people and lumps everyone else into a universal ‘it’. Historically, students of English grammar have been encouraged to use the ‘masculine rule’ when referring to a hypothetical person who could be either male or female; ‘he’, ‘him’ and ‘his’ would be the appropriate pronouns for both genders. Most recently, the use of ‘one’ or ‘he/she’ have been used as generic personal pronouns in an attempt to make the language less sexist. In the last five years, the ubiquitous ‘they’ has become the most favoured singular epicene pronoun. While many grammarians hate the use of ‘they’ as a singular pronoun, it’s a word that’s fast becoming more common with younger generations as well as copy editors alike. In fact, the American Copy Editors Society, the Chicago Manual of Style and the Associated Press have all updated their style guides to include the use of ‘they’, ‘them’ and ‘their’ to be acceptable in limited cases as a singular or gender-neutral pronoun when alternative wording is overly awkward or clumsy. Similarly, The Washington Post has updated its style guides, describing the acceptance of ‘they’ as a singular pronoun as “the only sensible solution to English’s lack of a gender-neutral third-person singular personal pronoun”, according to copy editor, Bill Walsh. While a more comprehensive solution to gender-neutral pronouns has proven elusive, some academics have proposed the creation of a set of new inclusive pronouns. Recent attempts have also been made by other mainland European countries to try and implement gender-neutral pronouns but have been met with harsh criticism. Grammatical changes to incorporate gender neutrality has always caused huge debate in France. But when a new primary school textbook was published last year, incorporating a new inclusive writing style, it sparked major backlash from the Académie française – France’s 400-year-old authority on language. Known as ‘écriture inclusive’, the new writing-style splits up words using a mid-punctuation point. But historically, French is packed with complex rules. The new writing style has been described as ‘jibberish’ by many critics. However, it’s been reported to be widely adopted in academia as well as backed by the state equality commission. While many countries may not seem progressive when it comes to the linguistic evolution of grammatical rules, there are some that have seen attitudes towards the introduction of gender-neutral pronouns improve over time. A third gender-neutral pronoun ‘hen’ was introduced in 2012 as an addition to the existing Swedish pronouns for she (hon) and he (han). The pronoun can be used generically when gender is unknown or irrelevant and as a pronoun for people who categorise themselves outside the gender dichotomy. It’s was met with widespread criticism at first and even hostile attacks were made on individuals who proposed the change. However, over time, attitudes quickly changed towards the new pronoun and in 2015, ‘hen’ was added to the Swedish dictionary. Research suggests attitudes changed much faster than behaviour in Sweden as the use of traditional pronouns were still cognitively dominant over the new form of pronouns. For a shift in behaviour to occur, ‘hen’ not only needed to be active but fully accessible, which came in the form of widespread use of the word in academia and in the media, most notably, in the lyrics in the Swedish entry into the Eurovision Song Contest in 2015. What followed was widespread adoption of the new pronoun in less than three years. As discussions around gender identity and stereotyping continue to be a topic of interest in Europe and the US, it’s likely that over time, languages will adapt relatively quickly to gender-neutral sentiment in order to remain inclusive and reflect progressive changes within a country’s culture.